One Sunday afternoon a few weeks ago, just after Thanksgiving, I received an email from someone I did not know. He is a restaurant owner in Maryland and he was reaching out to me on behalf of a woman who eats at his restaurant about once a week. Since she was a regular customer, the owner and his wife got to know the customer fairly well, and learned that her husband is a veteran. Curious, the restaurant owner’s wife did a little searching online for the veteran’s name and eventually came across my blog post about the POW bracelet I had worn with his name on it – it was the same person. She thought it was nice that this was a personal story, instead of just dry facts about his service, so she printed it out and showed it to the customer when she came in for dinner one weekend in November. The customer took the printed pages home and shared them with her husband, and they asked the restaurant owner to reach out to me on their behalf, to see if I was willing to be contacted by them. After reading that first email from the restaurant owner, I was thrilled, but a little suspicious – the internet can be a weird place these days. So I let my friend Google do a little searching for me and everything I came across about the restaurant and its owner confirmed that he was a real person with a real restaurant. So I responded, and let him know that I would be honored to hear from the veteran and his wife. Yesterday, I received a Christmas card from Captain Luna and his wife, with notes from each of them. I am overcome. I will keep most of their comments to myself, but the card basically expresses their gratitude for my supporting him by wearing his bracelet and for telling his story. THEIR gratitude?? I can’t even …. What we owe people like him, and like her, is beyond gratitude. And yet, here before me is a peaceful snowy scene, holding words I will always treasure. The connection is made, once again. I pass along this story so I can say this and perhaps encourage someone else: Sometimes, things happen when they are supposed to happen, and not before. If you are a person of faith, as I am, you often call it God’s timing. This little thing was hanging out there, in my story and in his story, until just the right time for it to happen, and when it did, it touched a small wounded place in my heart. It happened when I needed brightness and light, when I needed something extra to remind me of the strength and courage of average people, when I needed just … something. My life has been so blessed, I shouldn’t need reminders of grace. But after this year in particular, I did. And the reminder came, with perfect timing. There IS light … there IS hope … there IS goodness … just give it time. Back in May, I was wandering around a favorite antique mall outside of Atlanta. As I passed a locked glass case, I noticed a small poster. “$100 Reward!” Two people were wanted for arrest, probably in 1920, in Resaca, Georgia. I say “probably,” because I couldn’t read the entire thing – it was behind some other items and photographs. But I saw enough to be intrigued, took a quick photo with my phone to remind me, and started digging when I got home. Fast forward to September. I was back at the antique mall and decide to see if the little poster was still there. It was, so I bought it. Should have negotiated on the price a little, but I weighed the price against my curiosity, and curiosity won. I first thought of Bonnie and Clyde – I mean, how could I not, right?? First of all, her name is Bonnie, and there’s a guy, and a reward, and the word “arrest” … !!!! So I hit the newspapers …. Nothing … not one word. There was a reward and everything! How did it not make the papers? Time to look for census records. As for the other Farris Bishop, he grew up in another county, had more siblings, and died in 1943 near Savannah, Georgia. I’m pretty convinced this isn’t the same guy. The census records don’t really line up, and he didn’t live near enough to Resaca to be the right person. Bonnie Moore was a little easier to track. She was the daughter of Edward and Josephine Jones Stanford Moore. She had an older sister, Rena, and several half-siblings from her mother’s first marriage. Rena married a man named John Schmidt, and ended up living in California. But Bonnie stayed in Georgia, and appears in the 1930 and 1940 census records, living with her mother (her parents having divorced some time before 1930), and working as a saleslady for a dry goods store in 1930. By 1940, neither Bonnie nor Josephine is employed. After that …. crickets …. Josephine died in 1944, so what happened to Bonnie? Did she get married? Did she have children? Did she move to California to live with her sister? Then I ran across a family tree on Ancestry that had a photo of a girl named Bonnie Moore, and it was the same photo as the one on the little poster. Jackpot, right?? I was about to get all of the details on Bonnie and what happened to her. Click … and what have we here? photo, someone has written the names and “Don’t I look like a barrel?” Who is Harold? I sent a message to the owner of the tree, but have never received a response, although that person seems to be active on Ancestry. So I went back to the photo of Bonnie and her sister and checked to see who else had saved it to their trees. Only four other people, but one of them had another picture! This one showed Bonnie as a middle-aged woman, standing in a yard … gray hair, same body type, and still named “Bonnie Lee Moore” – no married name. This person also listed a death date for Bonnie in 1996, in Resaca. It also showed that Harold was Rena’s son, and that he married and had a child of his own. Bonnie’s death information led me to a site called “Find A Grave” (sounds morbid, I know, but it’s really great), where a person had posted both pictures – the picture of Bonnie and Rena and the photo of Bonnie as an older woman – to a grave listing for Bonnie. It seemed possible that this person is related to Bonnie and Rena, so I sent a message. Not long afterward, I got a response – LOVE the internet! William and I emailed back a forth a bit. Bonnie was his great-aunt, and he was able to tell me that she died at age 95, after living most of her life in Georgia and, as far as he knows, she never married or had any children. Unfortunately, he knew very little about her life, other than what he had posted and what I had already uncovered. But he was gracious enough to give me permission to write about what we do know, and to share it. So — Farris Bishop is a complete mystery, and Bonnie Moore seems to have led a perfectly normal, ordinary life, probably full of the highs and lows that occurred in most lives during the time period in which she lived. She was born before the Wright Brothers first flew, and she died when we were sending shuttles into space on a fairly regular basis. She lived during two World Wars and the Great Depression. She was born when William McKinley was president and died while Bill Clinton was president – eighteen administrations in all. Nothing remarkable, really … except for 1920. Something happened when she was 19 – a young man turned her head, perhaps, and persuaded her to walk with him down a path that seemed exciting and different. Or perhaps she persuaded him? Not sure I will ever know, but I keep coming back to this story over and over again. As always, if you know these people or discover more about the story, or if you have other comments, feel free to contact me here. And thanks for dropping by the blog …. 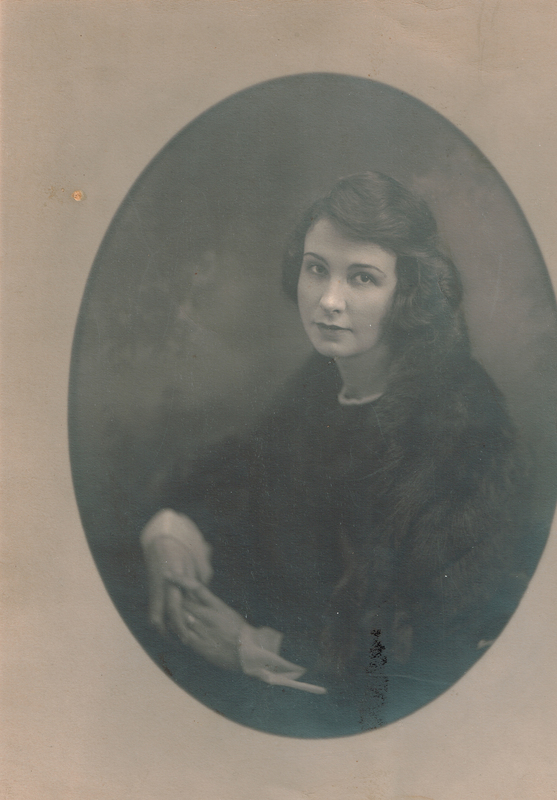 Included in the album of photographs from Hemingford High School was a portrait of Edith L. Melvin. I thought she was one of the students, but, in fact, she was their teacher. 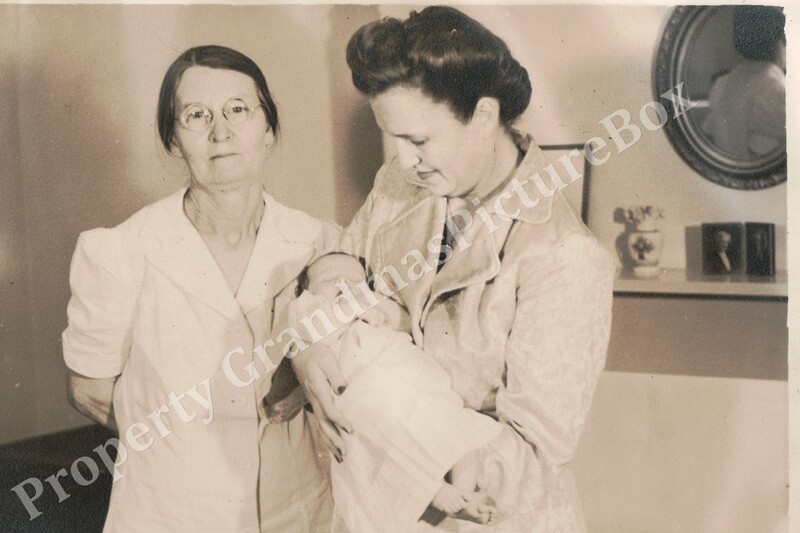 Edith Lucy Melvin was born to Emery L. Melvin and Alma Ellen Savage Melvin on November 24, 1891. 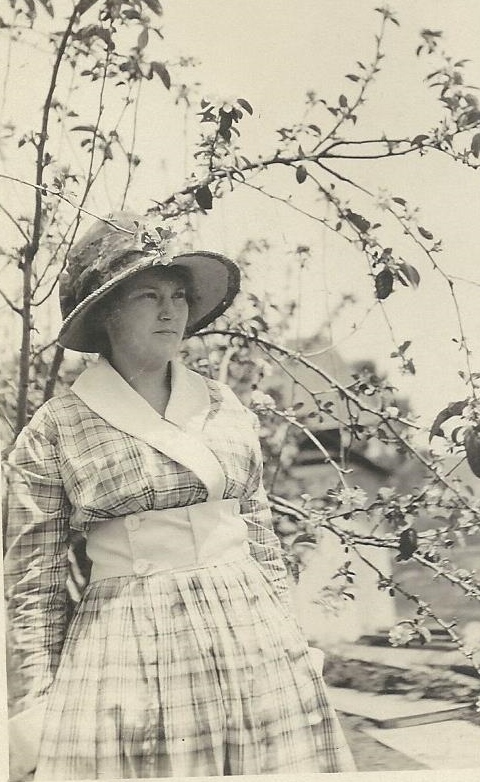 When Edith was born, the family was living in Cedar, Nebraska, and she grew up there. The 1920 U.S. Census shows her living in Willow Grove, Nebraska, where she was working as a teacher. On the webpage for Hemingford High School, where I found the group photo of this class, Edith appears on other class pages as well, listed as the principal of the school in 1929 and 1930, and she also taught orchestra and chorus. In 1930, just over 1000 people lived in Hemingford, Nebraska. It was decidedly a farming village, and the town itself was not even one square mile. The first home were sod houses. The town’s website notes, “In 1930, 1,893 carloads of potatoes were shipped from Hemingford and the town was known as the “Potato Capital of the World.” Who knew? An absolute mecca of commerce in this little village! Despite living in the hub of potato activity, it seems Edith wanted to reach for other things. City directories for the years from 1931 to 1938 show her living in Lincoln, Nebraska, where she was working in the registrar’s office at the University of Nebraska. Several articles in the Lincoln newspaper during that time, naming Edith in connection with various social events, usually include some sort of musical event or women’s organization. I gather Edith probably had a real affection for young people, since her career path to this point kept her in touch with students and their education. In 1941, a newspaper article noted her resignation as the assistant registrar at the University, as part of reorganization under new leadership at the University. After that, there isn’t much documentation on Edith, until May 1960 notes from the Board of Elections in Santa Barbara, California, which mention her as a clerk for Judge Whipple of the Board. I was unable to find any information on why she moved to California. 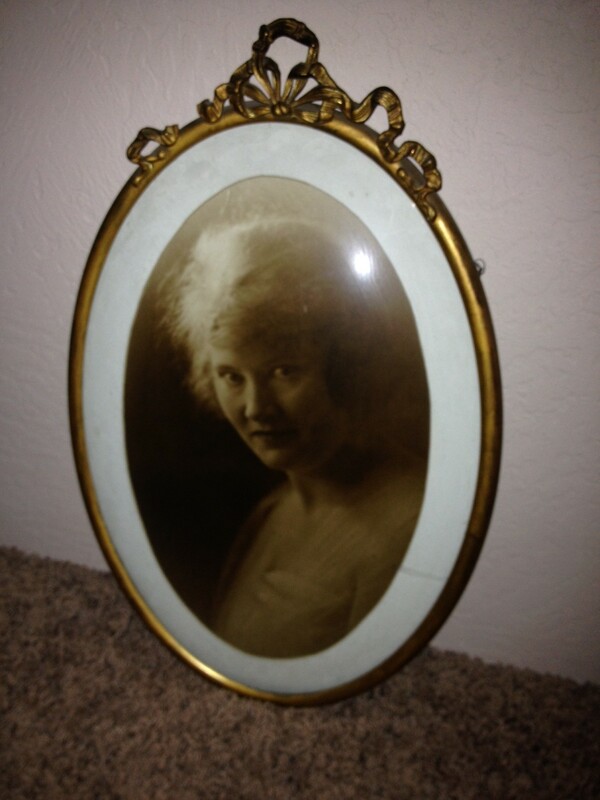 Edith had eight siblings: Etta (1890-1967); Rollin (1894-1980); Clarence (born 1896); Clarence (born 1897); Veva Isabelle (1899-1994) (married Christian F Nauenburg and moved to Colorado and then Santa Barbara, California); Harold (1901-1992); Donald (1904-1974); and Florence (1910-1952). I suspect Edith must have moved to Santa Barbara to be near her sister, Veva, who had a son, Harold Melvin Nauenburg. Harold married Gwenneth Nadine Blair and they had three children. Perhaps this was the family that Edith was able to enjoy, since she did not marry or have any children of her own. Santa Barbara Genealogical Society records reflect that Edith died in December 1977, was cremated, and her ashes interred at the Santa Barbara Cemetery. I suspect Edith was a very interesting lady – a music teacher and high school principle, who later worked at a major university and was involved in several social societies and musical organizations, and ended her working career for the Board of Elections in California. Perhaps her truest legacy was her connection with the students who came into her path. A truly death-defying legacy – good for you, Edith! 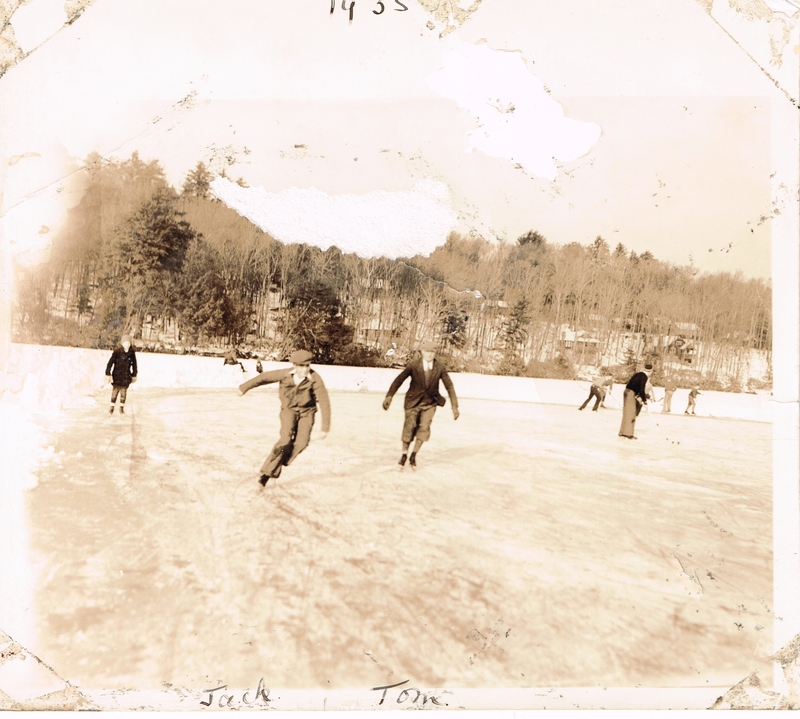 I saw the first image on a website where I buy old photographs. Look at her! And there was even a name – Doris McKinstry. I bid on the offering, not realizing that it was an album of faces – an album that is roughly 9 x 6, with a soft leather cover. When I received the album, I couldn’t stop looking at those faces. The seller called them a “beautiful portrait collection,” and she was right. Almost all were identified – 13 out of 20. There was no information on where the photos were taken, but the seller recalled purchasing this album at an estate sale in New Orleans, at a house on South Carrollton Avenue. No information remained on the occupant or the family, but the home had been empty for a while. So all I had were 13 names and 20 faces. Some of the names were unique enough that I began with those, and one location kept popping up: a village called Hemingford in Box Butte, Nebraska. I continued to search all of the names, just to make sure they were all in that area, and they were. In a situation like this, Google can be your best friend, so I let it run … and found THIS !! Check it out – every single one of my faces is in that composite – and only three are missing names. Fortunately, I have names for those three people from the album, so I had identified all 20 of these people. The photo was on the webpage of Hemingford High School, set up as part of an attempt to include information on every graduating class. So here they are – 20 classmates of Hemingford High School in Box Butte County, Nebraska. But how did this album get to New Orleans? Spoiler alert: I still don’t know the answer to that question. What I do know is some of their stories … not all of them, not yet. I don’t know which class member this album belonged to … was it Doris? Hers is the only photo that is colorized. Did it belong to Willard Donovan? His is the only one that mentions a year – “Willard Donovan ’28.” Or maybe it belonged to Margaret Willcox – her name included a married name. I hope you will allow me to tell your stories. MARY ANN BOLAND PEQUIGNOT – Family Found! 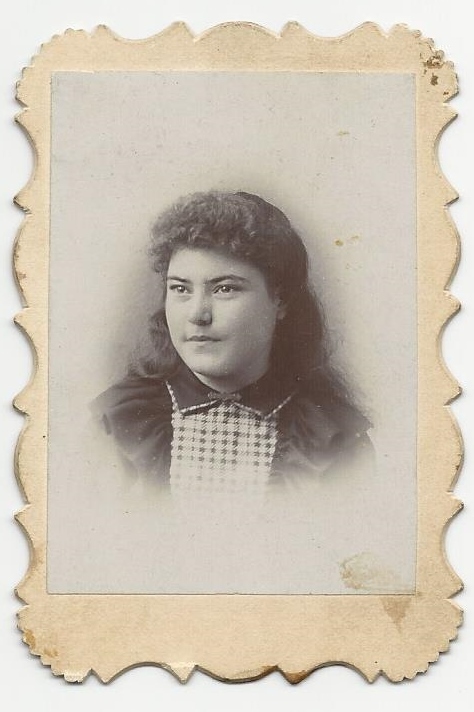 Mary Boland Pequignot – I found her photo almost five years ago, and two weeks ago, I mailed it to a member of her family. For over four years, I have looked for her, researched her, wondered about her, marveled at her, and stared at her face. Not constantly … I would go long stretches of time without ever thinking of her. And then there she was again and off I would go, spending a couple of hours looking at census forms or Google search results or newspaper articles. It took me four years to figure out when she died, and I was convinced there would be an obituary, naming her family members and the children of her sisters, so I could find them. Nope – never found it. After that blog post, I continued to search, and found additional census records that showed Mary living in New York or Boston, sometimes with her sister, Kate, sometimes alone. A year or so ago, I was able to determine when Mary died (1942) and where she was buried (Winthrop, Massachusetts). Kate died a couple of years later. Great information to have, but it brought me no other answers about Mary’s life or her surviving family. So I put the photo back in the drawer. When I had time, I would go the tree on Ancestry where I was storing the records and information I found, but I never really found anything new. The Lyons family of Massachusetts remembers Mary and her sisters, and has been gracious enough to fill in some of the details of their lives. It’s likely that Mary’s parents arrived in the United States from Ireland during the time of the Irish famine, so there is really no mystery as to why they came. They raised their family in Massachusetts and it seems, based on census records, that the sisters remained close and were a group of strong ladies. Mary’s sister Kate was a nurse (you may recall that Mary studied and taught nursing, and wrote a book about the care and feeding of invalids) and her sister Ellen lived in Lancaster and in Winthrop, raising her family there. Kate lived in Boston, and Mary lived in Worcester, although there are records showing that Mary traveled to Europe and she is shown in the 1940 census as living in New York City. (Interestingly, that census identifies Mary as a writer of fiction – I wonder if Mary gave them that information, and was working on something, or whether it was a misunderstanding of information given to them by the head of the household where Mary was a lodger?) As Mary aged, her family became concerned for her health and safety, and arranged to have her move back to Massachusetts, where the family saw to her care until she passed away. Nieces and nephews knew Aunt Mary was a teacher and that she was very smart, and that she had written a cookbook. Mary is buried in Winthrop, and Kate, Ellen, and Ellen’s family are all buried in Worcester County, Massachusetts. I am so happy to be sending this photograph to Mary’s family. She has been quite an inspiration over these past years. To women born in the last 30 years, her career as a teacher and writer may not seem that spectacular. But for a woman of her generation to have achieved these accomplishments and this level of education in the years between 1876 and 1920 was nothing short of spectacular, in my opinion. She did not come from a family of wealth, which could have opened doors and made a way for her. She opened those doors and made her own way, thank you very much. Indeed … thank you very much, Mary. LOUISE GENESTA BEAVOR WEBB LEONARD, or How Did a Friend of J.P. Morgan End Up at a Goodwill Sale? This story could also be subtitled “The Society Girl and the Mounted Policeman” … but more on that in a moment. Where to begin? How about with a random search on a Goodwill website that took me to a scrapbook? In my never-ending quest for old photos that are crying out to be reunited with their families, I ran across a scrapbook. Some of the posted photographs looked interesting, so I bid on it, and won the auction. Several days later, a treasure dropped into my hands. Louise Genesta Beavor-Webb, daughter of Alice May (of the Washington, D.C. May family) and John Beavor Webb, identified in the 1900 U.S. Census as a naval architect living in Nassau, NY and in Manhattan, on Park Avenue, no less! It seems Mr. Beavor Webb (born in Ireland) designed yachts, two of which, the Galatea and the Corsair (owned by J.P. Morgan) competed in the America’s Cup. Obviously, J.P. Morgan was a fan. 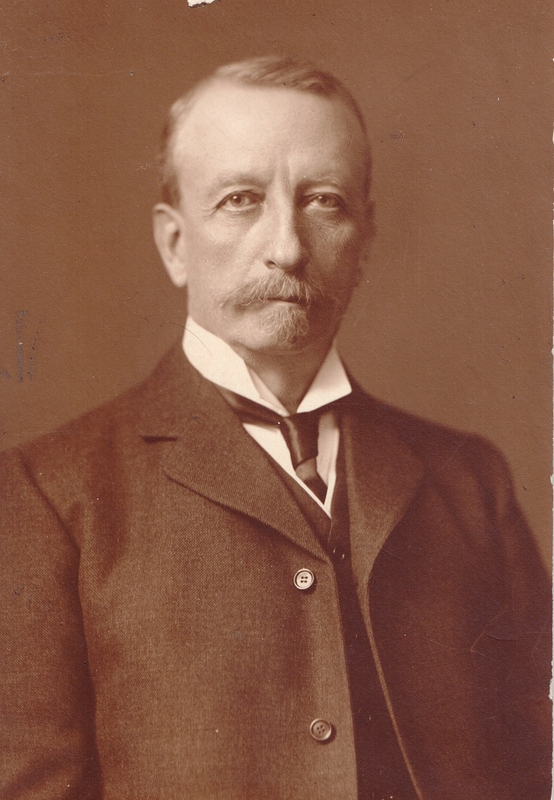 They became friends – such good friends that Mr. Morgan left Mr. Beavor-Webb $250,000 in his will. To you and me, here in 2015, that is the equivalent of roughly SIX MILLION DOLLARS! That was some friendship! John and Alice had three daughters – Louise Genesta (named after one of her father’s yachts, The Genesta), born in 1892; Edith Sybil, born in 1896; and Alice, born in 1898. The girls were raised in privilege, and all became accomplished horsewomen. This was a family who moved among the top society families, and, just as in 2015, their names were regularly in the newspapers. Back then, they called them “society pages” – today, we call it Entertainment Tonight and the Internet. Louise was the first daughter to raise eyebrows. While riding along a bridle path in Central Park, she encountered a young mounted policeman, Thomas J. Leonard. Eventually, a romance bloomed, and the two were married in 1920. Those three sentences do not come anywhere close to conveying the newspaper coverage of this relationship and marriage. I found articles everywhere – and by “articles,” I mean half-page, above-the-fold, big headline ARTICLES. But wait – there’s more! Barely a year later, Edith also “married beneath her” – another horseman! Edith married George Miles, who was the head groom at a nearby estate in New York. 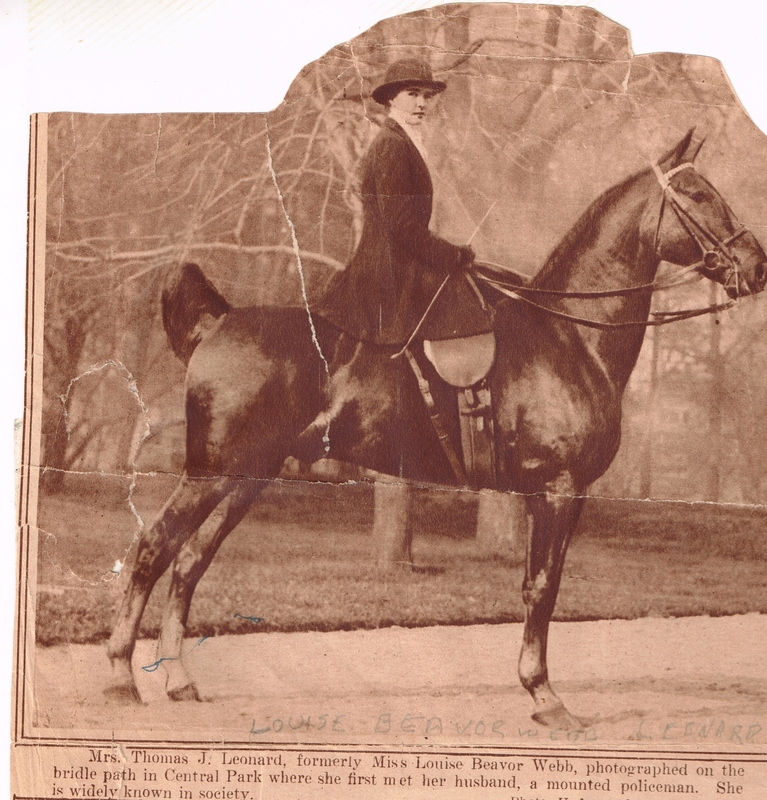 The newspapers were filled with stories of how she had followed Louise’s footsteps, and there was even an article about how horses had brought love and marriage to these two couples. Alice, however, broke tradition – despite an article asking quite cheekily if she was looking for a horseman for herself – and married a banker, David Rees Richards. Sadly, all was not sunshine and roses for the Beavor-Webbs as the girls grew up. John and Alice separated, and by the 1920 Census, they were living apart. The daughters lived with John on Park Avenue (31 Park Avenue, to be exact), and Alice was living elsewhere. They never divorced, but Alice was quite blatantly left out of John’s will, which was drawn up in 1916, according to the Buffalo, NY Courier Express of April 5, 1927. John died in March 1927, so he likely did not live to see his daughter, Alice, marry David Richards. I am not certain of when they were married, but believe it was some time around 1930. The good news is, all three marriages appear to have lasted, and all three produced children. Louise and Thomas had a son, John (also called Jack), and a daughter, Alice; Edith and George had a daughter, Edith; and Alice and Richard had two daughters, Joan and Gwen. Which brought me to the big question – who put together this album, and how did it end up at a Goodwill store in Florida? As I read articles about this family, I found it so curious that I could never find an obituary for any of the daughters. This seemed to be such a prominent family at one time – why no further coverage? The likely answer is that the changing times brought changing attitudes about what was interesting, and then, as now, newspaper readers were looking for the next hot story. The Beavor-Webb girls appear to have settled into happy marriages, raising their children – not enough scandal? – or maybe they fought to keep their names out of the public eye, for the benefit of their children. I continued to research, and although I have not located anyone directly descended from Louise, Edith, or Alice, I found a tree on Ancestry.com created by Derrick and his sister, Judy, that seemed to line up with the names, dates, and places I was finding, so I fired off a message and kept researching. Very quickly, I received an e-mail from Judy in Australia – AUSTRALIA??? As we compared notes, we realized that my Beavor-Webb scrapbook was about the family of her grandmother’s cousin. So much information has been lost over the years – and she was over the moon about getting a crazy email from a random stranger in the U.S.! Together, Judy and I have pieced together some further details of the Beavor-Webb sisters and their families, although we know there is more discover. As you read this, the album is making its journey from Atlanta, Georgia to Australia – full of lovely surprises for Judy, Derrick, and their family. Judy graciously allowed me to share some pictures with you, and some of her family’s details. If any of these names or faces are familiar to you, feel free to contact me, and I will put you in touch with Judy and Derrick. Thanks for stopping by – it’s always such fun to tell these stories! Still Searching … Are You My Descendant? It’s so great to be able to post photo reunion stories. I have had several recent reunions and it just makes my day every time I put one of those pictures in the mail. That’s always a good day. Over the past three or four months, I have sent pictures to Pennsylvania, Colorado, California, and even Hawaii. Then I see my boxes (yes, “boxes” plural) of photographs and photo albums and even family Bibles that are currently unattached to their families. Even if I never bought another one, I would have enough projects in those boxes to keep me occupied for a good, long time. But it’s sad to look at those folders of names, and those fascinating images, and think that no one sees them except me. So I’m sharing … who knows? Maybe someone is researching one of these folks, this week. First, we have Charles Heald Bennett and Jennie May Bennett – no dates, no place named. At first, I assumed they were a married couple, but if you look at them closely, it’s fairly easy to tell they are related. And sure enough, I found them listed in the 1900 Census for Cayuga, New York. Father, William I. Bennett, age 54, was a “picture enlarger.” Mother, Maria, was 51, and their son, Charles, age 26, is listed as a physician. He and his wife, Mittie (age 29), and their daughter, Genevieve (age 3), were living with his parents, along with his sister, Jennie, age 22, who was a music teacher. There they are! Charles and Jennie – very exciting! I continued to find evidence of Charles, Mittie, and Genevieve in the 1910, 1920, and 1930 censuses, and a 1902 City Directory for Auburn, NY, lists Jennie as a music teacher, living at 8 Hoffman Street. I found Genevieve in the 1940 census, still named Bennett, so … never married? Last, I found two cemetery listings for Genevieve and Mittie. Mittie died in 1960 and Genevieve in 1948. But nothing on Charles or Jennie. Perhaps another rainy day research project? I found this in Chamblee, Georgia, so I made the leap that “Ft. Mac” is Fort MacPherson, in East Point, Georgia, just south of Atlanta. During WWII, the U.S. Army Nurse Corps had a presence there, so I assume this baby was the daughter of one of the enlisted men. But here’s the thing: “Jenny Wren” may not actually be her name. When you enter “Jenny Wren” into the Google search bar, the first listings are references to a song by Paul McCartney, and I’m going to assume Sir Paul likely never met a girl born at Ft. Mac during WWII, although it is certainly possible when he was here 49 years ago with three of his friends. There is also a nursery rhyme which mentions a “Jenny Wren,” and both Shakespeare and Dickens used the name. But I can’t find any instance of an actual person born in Georgia during the war named “Jenny Wren.” It was likely a nickname that “Mama” used for her little girl babies. Not sure I’ll ever figure this one out, but the picture captivates me. 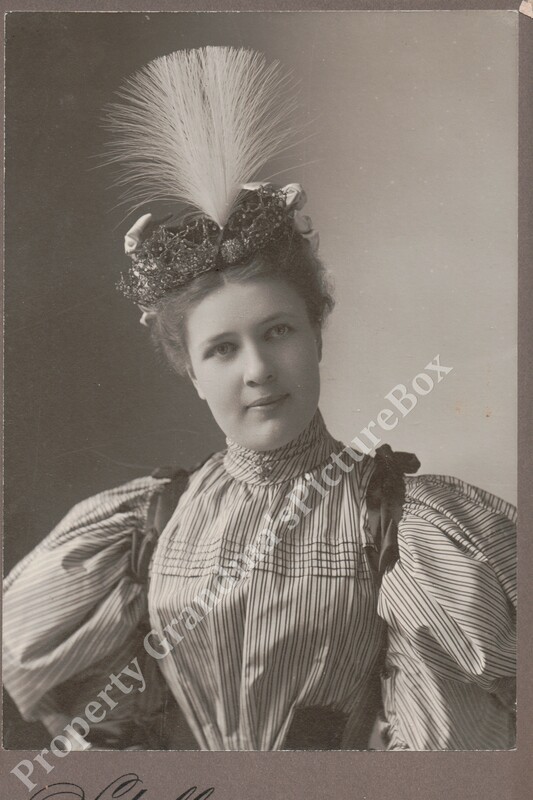 And finally, please meet Abbie Bullis Weiser and her FABULOUS hat! Abbie Bullis was born in 1873 in Iowa. This photograph was taken in 1895. In 1914, a ship’s manifest lists Abbie and her husband, Charles Weiser (born 1865), arriving in New York City from Hamburg, Germany, on their way home to Decorah, Iowa. Traveling with them were “E. Weiser and Grace Weiser,” ages 47 and 40, respectively, who were headed for Fargo, North Dakota. Charles’s brother, perhaps? In 1920, Charles and Abbie are listed as living in Decorah, Iowa, with their three children: Horace, age 21; Charles, Jr., age 18; and Hubert, age 11. Charles was 55 years old at the time, and a banker; Abbie was 46. Twenty years later, the 1940 Census finds Abbie living in Los Angeles with her son, Hubert, the assistant manager of a hotel. Interestingly, the census lists Abbie as “divorced” … wonder what happened? Finally, Abbie passed away in 1955, and is laid to rest at Forest Lawn Cemetery. Oooh! Wonder if she is buried near Clark Gable and Carole Lombard??? Oh, well … Abbie looks like an interesting person, and I hope that hat went to a granddaughter (although I have not yet found one). More research – this picture belongs on SOMEbody’s mantle !! As always, if you see a name you recognize, please contact me. I would love to get these pictures in the hands of living family members. Fast-forward to 2013-2014, and I know a little more about Jose David Luna. Based on information from various POW websites, he was held at the “Hanoi Hilton,” among other places, before being released in 1973. He stayed in the Air Force, married, and lived in Maryland. I believe he finally retired as a Lt. Colonel – I did not find an obituary, so I assume he is still alive. I didn’t really research any further than that – it was enough to know that he is still around. 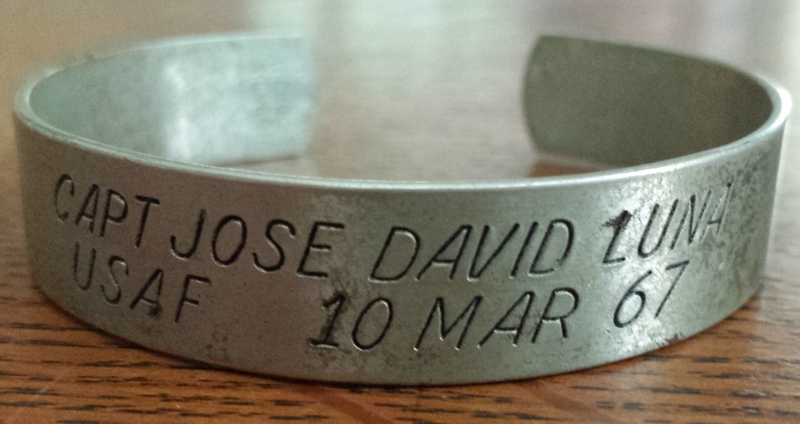 Today, on Memorial Day 2014, I dug out that bracelet. Forty-plus years later, and I remember that day so clearly. Lt. Col. Luna – I salute you today on Memorial Day. I am grateful for your service and for your sacrifice. I may never meet you, but you still hold a special place in my memory. So, it has been a while since I posted. Life gets busy, doesn’t it? And while I was busy, things were happening out there in Old Photo Reunion Land. This success story began back in January 2013. I found a couple of photographs online from a seller at Etsy.com. They were interesting, so I thought I would buy them and see what I could find out. The first one seemed specific enough that I should be able to find her, and I did. On FamilySearch.com, I found a Mary Evelyn Hammond married to Norman James Latter, and additional research yielded more information on Norman than on Mary. According to U.S. Census forms, Norman was born in 1887 in Ontario, Canada, and by 1900, he was living in Los Angeles, California. I found his draft registration for WWI, and a death notice from May 1961. I also noted that this particular Etsy seller had a photo of a little boy named Charles William Latter, but it had already been sold. Nonetheless, I thought the name may be a clue. I found him in a 1930 Census for Los Angeles. The household listing showed Norman J. Latter, age 42, a plumber, who had arrived in the U.S. from Canada in 1895 – must be our guy! According to the Census, his parents were both from England. His wife was listed as Mary E. Latter (yay! Mary Evelyn), age 30, born in Missouri, and their two children were listed as Norman Latter, age 6, and Charles W. Latter, age 5 (the other photo – I’m on a roll! ), both born in California. 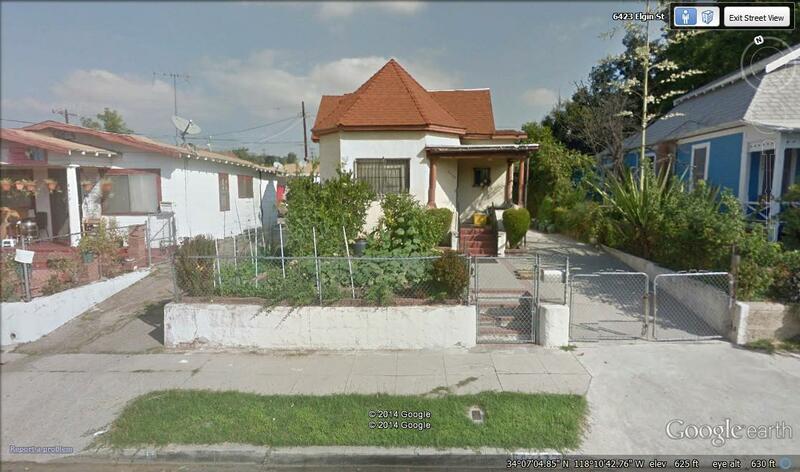 In the 1940 Census, all four were living at 6423 Elgin Street in Los Angeles. When I searched for Nellie Latter (in the second photo), I found a listing for her in the 1895 and 1896 Los Angeles City Directories, and it listed her as a dressmaker, living at 1415 Barbee, with a “Miss Rose Latter,” also a dressmaker. Unfortunately, that house number no longer shows up in a Google Earth search, and I didn’t have any real luck with a quick search of the U.S. Census for 1900. 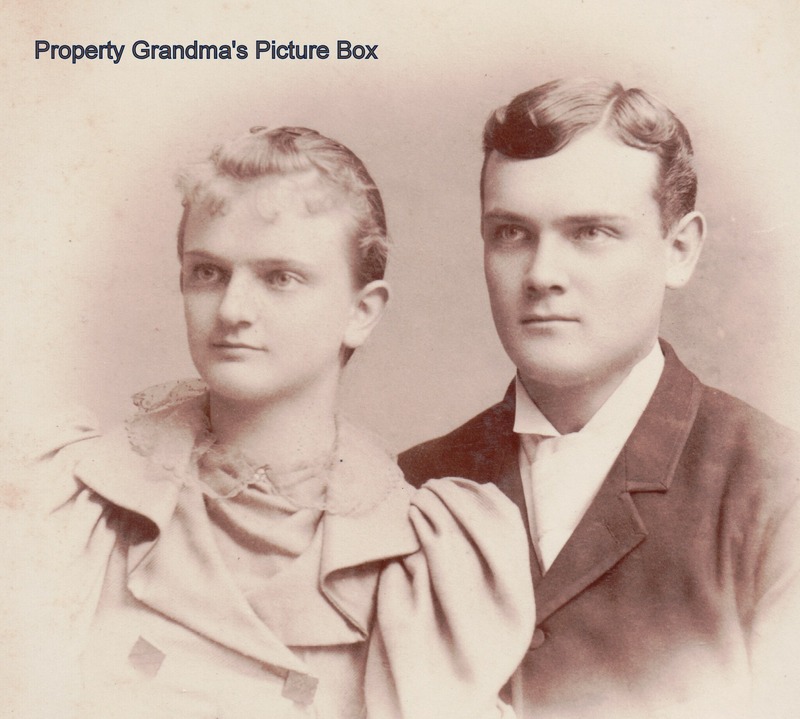 I was able to find a few birth listings for the children and grandchildren of Norman and Mary Evelyn, but most of the information came to a roadblock or two when trying to find living relatives. After a couple of days, I decided to post an inquiry on Ancestry.com, and see what happened. Then, I waited. And then life stuff happened, and I wasn’t really thinking about it anymore, except when I boxed up these old photos when we moved. It became one among many in a whole roomful of “one day when our new office is set up” boxes. Then, in late March 2014, I got an e-mail from a woman named Peggy, who identified herself as one of Mary Evelyn and Norman Latter’s four granddaughters. After digging around in the “office” (nope – still not set up yet), I put my hands on the photos and e-mailed Peggy to let her know I had found them. She and I e-mailed back and forth a few times, and she was able to give me a little more family history. 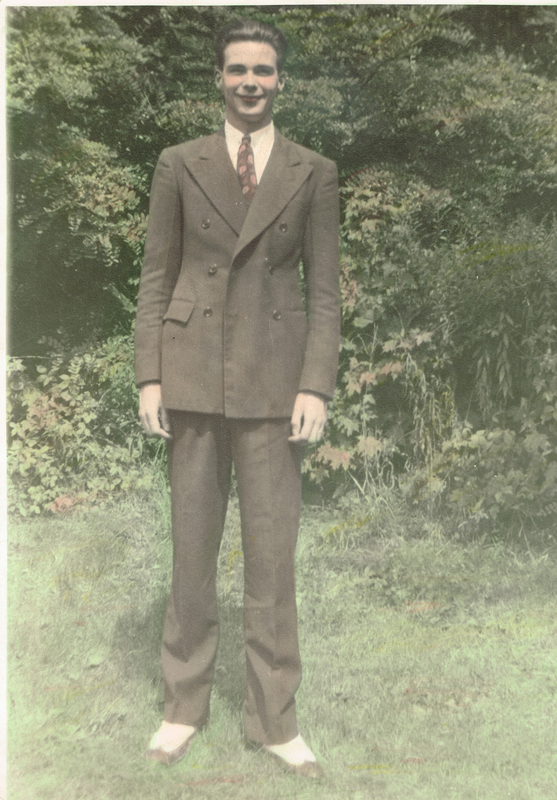 Peggy told me that her father, Mary and Norman’s older son, was an avid photographer in the 1940s, 50s, and 60s. We both wondered if this picture of Mary was one that he had taken. Peggy was also able to tell me that Nellie (the girl in the second photo) was Norman Sr.’s sister, one of two unmarried sisters. Apparently, both sisters – Nellie and Mabel – lived in Highland Park, California, and Peggy remembered them as wonderful ladies. The family still owns some of their bedroom furniture, and Peggy herself has two beautiful ostrich feather fans given to the girls by someone who owned an ostrich farm near Highland Park. There were also brothers, but Peggy did not know them well or have a lot of information on them at the time. 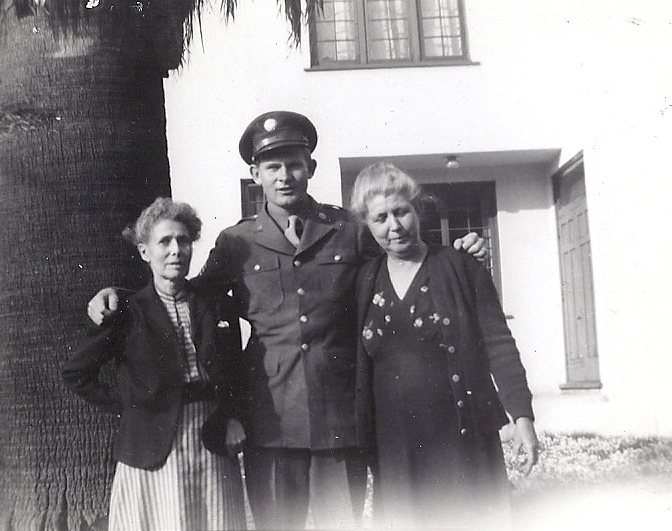 Mary had siblings as well – her brother, Paul, met and married a French woman, Marie, during WWI, and they lived in Oxnard, California. Mary also had a sister, Elsie, who married a man named Clair Barnum, and they lived in San Francisco before retiring to Seaside, Oregon. Peggy was able to share with me some further information on Mary, Norman, their children, and grandchildren. If anyone is interested in contacting Peggy for a little family research, get in touch with me here, and I will put you in contact with Peggy. With all apologies to W.P. Kinsella – author of “Shoeless Joe,” which became the film “Field of Dreams”- I guess if you ask it, they will come … eventually. It’s reunion week here at Grandma’s Picture Box !! First, the Waage/Plocher/Krenzer album made its way home. And then the very next day, I got a message in response to the photo of James Justice. I found Rev. Justice’s photograph in Asheville, NC last April, and posted about him in July. 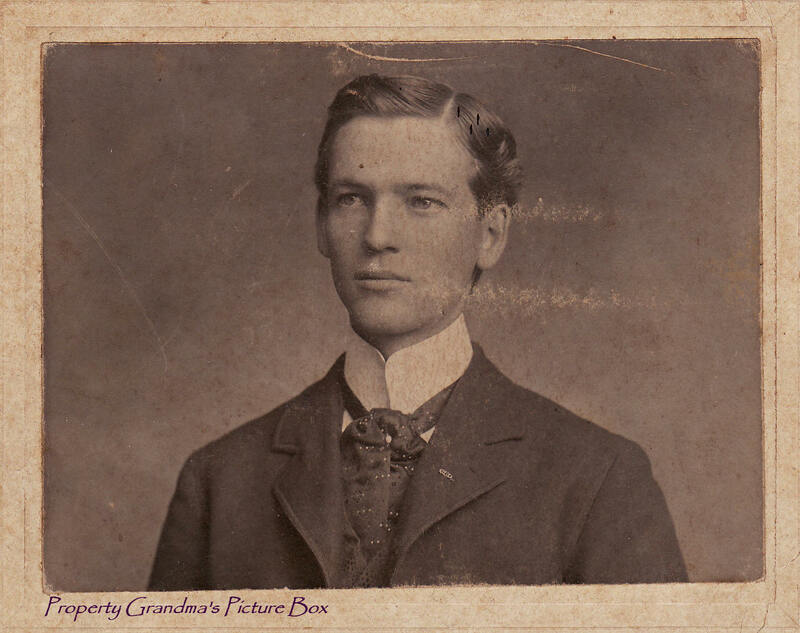 James Monroe Justice – born 4/10/1876 was the Superintendent of Henderson County Schools at the age of 19. At the age of 23, he decided if he was going to remain in education that he should get the necessary education credentials and he attended the University of North Carolina for 2 years. During this time he decided to go into the Ministry and transferred to Wake Forest and then went to the Baptist Theological Seminary in Louisville, Ky. He spent a year in Cuba tutoring a family of children and as the story goes he taught them English and they in turn taught him Spanish. He returned to the US and married my grandmother – Mattie (Martha) Lou Cox in 1908 in Georgia. I believe it was in 1912 that they went to Buenos Aires, Argentina on a mission and my dad was born on 8/28/1913. It was in either 1917 or 1918 when they returned to the US. The history reports that they lived in Hendersonville for 6 months, then in Black Mountain where he was a Pastor until 1922, next in Bryson City for a year. They then moved to Kansas City, MO, where he was in charge of the operation projecting work for the Baptist Convention working in both Kansas City, MO and Kansas City, Kansas for 3.5 years. They returned to Black Mountain around 1927 and then to Hendersonville to recuperate from his ill health. He died in Hendersonville on 10/28/1938. I believe my dad was in college at the University of Missouri – School of Journalism at the time of his father’s death. My grandmother died in 9/47. My dad [ Samuel Justice ] moved to Charlotte, N.C following college and wrote for the Charlotte Observer. As you know he joined the Navy and was a Lieutenant. He met my mother at a dance in New York City when he was on leave and they married 6 months later on 11/20/44. He spent the majority of his career in Public Relations. He was the Washington correspondent for Business Weekly and the family lived in Maryland for approximately 10 years. We then moved to NY where he worked in the banking industry in Financial Public Relations. We lived in Yonkers, NY for 30+ years. After retirement my parents lived in New Jersey and then Sarasota, Fl. Both are now deceased. Dad died 12/14/2000 and my mom 3/17/2003. Jennifer, thanks so much for telling us the story of your family. I just knew that face had an interesting life ahead of him. Speaking of the face, apparently Jennifer’s sister really looks like their grandfather – amazing to see yourself in a photo from this era! Two fun parts of this reunion story: (1) The Justice family is headed for a family reunion this summer – what a happy coincidence that Jennifer discovered this photo in time to have it there for everyone to see; and (2) Jennifer’s husband is a historian in their community – wouldn’t I just love to spend an hour picking his brain on research techniques ???? Every time this happens, I am amazed and excited and reminded once again that this big ol’ world isn’t always so big. Every life is an important one. Every family is completely unique. Every person leaves an imprint. Welcome home, Reverend Justice … you’ve had a long journey ! !